Disease Prevention (Ticks, Wounds, Vaccination) | Infonet Biovision Home. Prevention of diseases is always both better and cheaper than treatment. Even if vaccines and other preventive measures may seem expensive, they are in the long run much cheaper than loosing animals or letting animals suffer and loose condition and buying expensive drugs - not to mention the fees of the vets. The following public and private disease prevention measures also protects the rights of the animals to a worthy enjoyable life and are the pillars of good and successful management. In East Africa many serious diseases are transferred by ticks. This is less severe in Zero-grazing units than in animals grazing pastures and interacting with a certain amount of wildlife. 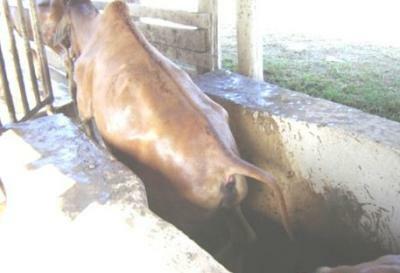 The picture shows a typical cattle dip, preventing insect and particularly tick borne diseases, by letting the animals jump into a dip filled water with added acaricide (tick poison). Prevention of tick borne diseases is by spraying, dipping or using Pour-on chemicals to get rid of the ticks. For organic farmers it always important to have as little poison on the farm as possible, and to choose the least harmful types of acaricides. Many dips have serious problems. However even organic farmers have to spray their animals, as regulations demand that the animals are kept healthy and comfortable. For smallholders and organic farmers there are alternatives like hand-spraying by knapsack. These are structures built on ranches or communally where animals are driven through a bath of acaricides. It is an easy procedure but quite costly, and there can often be cases of animals that swallow some amount of dip solution with varying results from death of the animal to some degree of poisoning. - Heavily contaminated dirty dip fluid may cause infections in animals going through the dip (e.g. inside the ears). Dips must be carefully maintained to ensure the concentration of acaricides is appropriate at all times. Too low concentration can lead to ineffective tick control and tick resistance to the acaricide used. Many dips have serious problems and are non-functional. There is also the problem of environmental pollution when dips need to be cleaned out. Where to throw all the old toxic waste? Spray races are modernized dips, where cattle walk through a set of nozzles spraying acaricides to cover the whole animal. The spraying is done mechanically by pumps, with very little need for human labour. It is less hazardous than dips, and as the left over spray is recollected, strained and reused there is less waste of acaricides. The concentration of acaricides is also much easier to regulate than for dips. As animals walk into the spray race they prepare themselves to be sprayed by closing their mouths and avoiding too much inbreathing. The spray races also have far less problems with poisoning and infections of animals than dips. As most small scale farmers do not have access to dips or spray races, the best option becomes spraying by back pack sprayer. This is labour consuming and it is easy to miss areas on the animals (often under the tail, inside the ear or behind leg joints), where ticks can then hide and multiply. It is also important to avoid spraying directly into the animal's noses and open eyes. Animals can go blind from getting acaricides into their eyes, and can get poisoned by too much acaricide sprayed into their noses. Pour-on acaricides are slowly becoming more popular. These are formulated in a way that a certain amount is simply poured along the back of the animal, from where the acaricide distributes itself evenly over the whole hide of the animal. Pour-on's are very effective but still quite expensive. Quarantine refers to the total ban on movement of livestock and livestock products from one administrative unit (district) to another following an outbreak of a notifiable disease. Quarantine is normally imposed by the veterinary authorities as a disease control measure. Livestock Movement Control refers to a continous (in force all the time) disease control measure whereby all animals for trade or breeding purpose, moving from one adminstrative unit (district) to another must be inspected and be certified healthy and free from specific notifiable diseases before permits authorising such movement are issued by the inspecting officer. It is an offence for a person to move animals from one adminstrative unit to another without a permit authorising such movement. Quarantine and livestock movement control helps veterinary authorities to contain disease outbreaks hence minimising socio-economic losses through deaths and closure of livestock markets. It also helps to minimise the risk of diseases spreading to clean areas. NOTE: Most producers and traders view quarantine/livestock movement control regulations negatively but it should be understood that its a disease control measure used by veterinary authorities for the benefit of all stakeholders in the livestock industry and if these rules and regulations are followed, the veterinary authorities are able to contain disease outbreaks faster and hence hasten the lifting of a quarantine. The word 'wound' is taken to mean any break in the skin or mucous membrane. The underlying tissue is frequently also involved. Wounds occur in all animals on every farm and arise from a variety of causes. Wounds may be classified in various ways. For example they may be described according to their site - wounds of the neck, head, chest, abdomen or limbs. Another classification may indicate their particular type - for example crushing, lacerating or penetrating wounds, bites by other animals, snakes or insects etc, cuts or burns. Wounds may be fresh, bleeding, infected, gangrenous or swollen. Some wounds may be small and insignificant. Others may be large and even life-threatening, especially if they involve major blood vessels or if they become infested by maggots. Such descriptions are important when describing the nature of a wound to a veterinarian who then should be in a position to offer useful advice even if he, or she, is unable to attend personally to the case. It is best to assume that all wounds are potentially infected and to treat them as such, irrespective of their cause, site or nature. Large, deep wounds requiring suturing are best dealt with by a veterinarian but the layperson can do much either to make things easier until the arrival of a qualified person or to treat smaller wounds without outside assistance. Contamination of wounds may lead to severe generalized disease such as gas gangrene, tetanus etc as the bacteria which cause such diseases are found in the soil or even in the buildings where animals are housed and can easily infect untreated wounds. The most important principle in the care of fresh wounds is to maintain the viability and the defensive mechanisms of the tissues, so that they may play a part, unweakened, in the healing process. All harmful influences must be avoided during and after treatment. All instruments and utensils and dressing must be scrupulously clean before use. Hands must be washed and scrubbed. If there is bleeding this must be stopped. Unless the bleeding is very severe as from a large severed blood vessel then firm pressure with a pad of dry cloth, towel or large wad of cotton wool over a period of several minutes should in time arrest the haemorrhage. If this pressure is not sufficient and the bleeding continues and begins to weaken the animal then a tourniquet may be applied. This is a firm band applied and tied a few inches away from the wound on the side nearest to the heart. This may be made from anything that is strong and long enough - a bandage, a handkerchief, a rope, a piece of inner tubing etc. With any tourniquet the pressure should be maintained for a few minutes after the bleeding has stopped but it should never ever be tied for longer than necessary and never longer than 15 minutes or so. Once the bleeding has stopped wait for a few more minutes. Then carefully shave the edges of the wound for about 2-3 inches all round. Then clean the edges with antiseptic or spirit. If there is foreign material in the wound such as dirt, grass, glass, grit, dung, this should be carefully removed and the wound washed out with saline or clean water. Apply iodine ointment or Lugol solution (= iodine solution) on the wound. Narrow deep wounds (e.g. dog bites) can be treated by instilling intramammary tubes into the wound openings. If the wound is a gaping one then it will be necessary to join the edges together with stitches to accelerate healing. This must be done by a veterinary. The stitches may be done with nylon sutures, or with thick sewing-cotton or thin tape if nylon is unavailable. The injection of local anaesthetic along the edges of the wound will greatly ease the insertion of stitches and is obviously more humane. If no surgical needle is available then a large-eyed sewing needle will serve the purpose. The stitches should be single and separate and loosely tied. All material should be boiled before use and the operator's hands must be scrubbed clean. Stitching up or taping wounds when done by by a lay person results almost invariably in severe anaerobic infection! If there is no veterinary you must leave the wound open, cleaning it regularly (e.g. with hydrogen peroxide) and reapplying wound ointment or wound powder. It should be given for large and for heavily contaminated wounds in addition to the topical treatment. If healing does not proceed cleanly and pus appears then remove the lower stitches to allow drainage and keep the wound clean and open until healing occurs. All wounds must be protected against flies which may lay their eggs in wounds which may then become infested with maggots. Stockholm tar helps cover wounds and keeps flies away. Puncture wounds are wounds such as bites, thorn injury etc, they should not be stitched, but left open to drain and cleaned and treated frequently with antibiotic either locally or by injection. All discharges of pus or serum should be washed away whenever they appear. Contusions or bruises where the skin is unbroken may result in damage to underlying tissues in the form of swelling, internal bleeding and tearing of muscles, tendons and ligaments. There may be considerable pain, and the area may be swollen, tense, hot and become discoloured black, red or purple. Most bruises resolve without any special treatment but may benefit from the application of cold water, ice or in some cases by the application of a kaolin and glycerine poultice. Bleeding underneath the skin and inside tissues can result in Haematomas. These are large accumulations of blood, which are usually not painful. If left alone they will gradually shrink as the blood inside clots and is absorbed. A haematoma should never be opened by a lay person, this is what a vet may sometimes do, but not a farmer! If done by a lay person it is the perfect recipy for infecting a sterile haematoma. An abscess is a circumscribed swelling with pus usually below the skin. It must be differentiated from other swellings such as those caused by hernias, ruptures, tumours, cysts and haematomas. Fresh abscesses are usually hot and painful when touched, whereas ruptures, hernias, tumours, haematomas and cysts are normally not painful and not hot. Check by feeling the swelling carefully. A hernia or rupture is usually soft and can be pushed back into the body. When suspecting a hernia or rupture (usually occur on the lowest part of the belly), which may contain a loop of intestine call a vet. Cutting such a swelling could be disastrous, because the intestine may come out. Most abscesses are hard and hot in the beginning and later become soft and cold. An animal with an abscess may have a raised body temperature due to the pus inside the abscess. Squeezing the abscess may cause pus to ooze through the skin. Abscesses can be treated either by fomenting the overlying skin until the abscess bursts and drains, or by lancing them. In the former method mix salt or Epsom salts in water as hot as you can tolerate when sticking your hand into the solution(for example add a teaspoonful of salt to half a litre of water). Soak a piece of clean cloth or cotton wool with this solution and hold it on the swelling. When the cloth gets cool soak it again in the hot solution. Continue for about 5 minutes and do this at least 4 times daily. - You may also apply an ointment containing camphor on the skin above the abscess that generates heat locally, such as "Deep Heat". The skin above the abscess may soften and break, discharging pus, which may smell foul. Keep on flushing the inside of the abscess with Hydrogen Peroxide solution to encourage the drainage to continue so that no pus remains when the skin closes and heals. If the abscess does not burst then it may be necessary to cut it open. This is done using a scalpel or a very sharp, very clean blade. Shave the hair over the swelling and clean the area with soap and water, followed by surgical spirit or alcohol. Cut boldly through the skin at the lowest point of the abscess to facilitate drainage. Sometimes you may have to cut quite deeply. Make one long vertical cut. Place a clean finger through the hole to help to release the pus which should pour out, often under pressure. When the pus has stopped flowing, flush the cavity with a working strength solution of iodine or hydrogen peroxide. Continue bathing the area with a warm salt solution or hydrogen peroxide solution for the next few days. If the abscess was large give an injection of antibiotic, such as oxytetracycline. Healing should take place within a week or so. Tetanus can develop in small narrow deep wounds that heal and close rapidly on the skin surface, but with active infection remaining inside. In such cases animals should be vaccinated against tetanus (see next paragraph, esp. sheep are very susceptible to tetanus). Very many animal diseases are preventable by vaccination and scientists are constantly searching for new vaccines to prevent diseases. Only healthy animals should be vaccinated, because weak animals will not respond effectively. Some weak animals can even become sick from the vaccines. After injection, vaccines take a minimum of 2 weeks or more to take good protective effect. Do not use antibiotics and other drugs in connection with vaccines, as they may interfere with the protective effects of the vaccine. Try to avoid disinfectants during vaccinations. Use sterilization by boiling water or use new disposable needles. Avoid using chlorinated water when giving chicken oral vaccines. Use rain water, spring water or borehole water sterilised by boiling - but NOT Chlorinated water. When using live vaccines some animals may develop mild symptoms of the illness. This is no cause for alarm, as it actaully shows that the vaccine is working well. In some countries farmers are using immuno stimulants to raise the general level of immunity against viral diseases in general. These products are not yet available in East Africa in 2010. 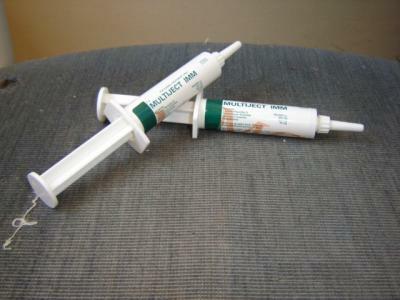 Most veterinary vaccines in Kenya are produced by KEVEVAPI Kabete. But some are also imported. The following vaccines are available in East Africa to prevent infectious diseases in livestock. Vaccination regime recommended for commercial layer and broiler chicks, but the bold printed vaccines are also applicable to improved management of indigenous chicken (modified from Sigma recommendations). The most important vaccination in chicken is against Newcastle disease which can wipe out entire chicken populations. 3-8 months for heifers Brucellosis S/C - Once in a lifetime During threats of outbreak the whole breeding herd may be vaccinated. Use vaccine with care. S19 live vaccine, if accidentally injected into humans can cause brucellosis in humans. 3 months to 3 years Anthrax and Blackquater S/C - Yearly or upon warning of impending outbreak Vaccine is cheap, SO USE IT. Anthrax is deadly for humans and animals. Yearly in endemic areas. In other areas only upon warning of impending outbreak. Vaccinated into the tip of the tail. Consult your veterinary authorities.To be administered by trained veterinarians only. Animals can sometimes loose the tip of their tails from this vaccination. S/C under the ear. Vaccine is commercialized in Tanzania and in Kenya Only to be used by licensed Veterinarians who are trained of application of the ECE Infection and Treatment Methods. 2 weeks and above Foot and Mouth disease (FMD) S/C - Every 6 months in endemic areas. All of East Africa is endemic for FMD Different strains exist. Consult you veterinarian on the choice of vaccine. To be administered by trained government veterinarians. 3 months and above Rabies I/M or S/C - Cattle can be vaccinated annually and must be vaccinated when there is an outbreak Vaccine is normally provided by the government vet. This is the only method that can protect herds affected by rabies (rabies is mostly introduced by bites from rabid dogs) if rabies vaccination is done within maximum one week after the rabid animal came into the herd.Report suspected cases immediately to the District Veterinary officer. 6 months and above Rift Valley Fever S/C - Preventive after heavy rains or when there is a risk of outbreak. A live vaccine is used. Vaccination is only carried out under order by the DVS. Pregnant animals may abort from the vaccination. Live vaccines may also be dangerous for humans, so HANDLE WITH CARE. RVF in humans can be deadly so control is very important. A new live RVF vaccine which does not cause abortions in livestock has been developed but is not yet registered in Kenya. 2 weeks and above Sheep and Goat pox S/C Annual vaccinations Without vaccination this disease Sheep and Goat pox may kill many lambs and kids. In serious cases mortality may be high. 1 month and above Orf Scarification method. If there is a risk of outbreak or. In endemic areas routine vaccination is recommended Orf may be more common in goats due to their feeding habits as browsers of thorny bushes. Mortality of young can be high.Repeat vaccination should be done 2-3 months after the initial one. The vaccine is live and can affect people, so HANDLE WITH CARE. Brucellosis Specific Brucellosis Vaccine for sheep and goat is not available in East Africa. 2 weeks and above Tetanus S/C Annually or when an animal has an open wound or after operations. Tetanus is fatal so vaccination is highly recommended. Donkeys are more prone to tetanus, as they frequently have open wounds.